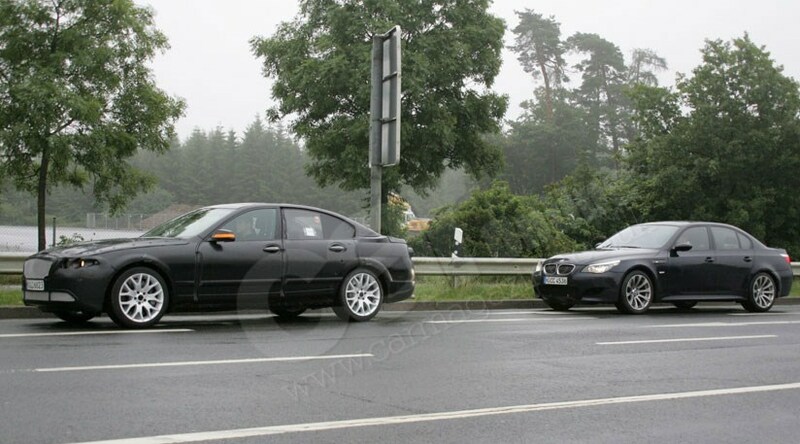 CAR has just bagged spy photos of the new BMW M5 out on test in Germany with its predecessor. The next-generation hot 5-series will not use the current 5.0-litre V10, which can only survive in production until 2011 because of ever-tightening emissions regs. In its place, the new M5 will use a twin-turbo V8 tuned to produce more power than today's hot-shot Five. The new 5-series is due in 2009, pointing to an M-powered version the following year. And the new M5 won't mess with a winning formula; it will still mix executive comfort with supercar-slaying performance. How so? Well, the new twin-turbo 4.4-litre V8 is said to send around 540bhp to the rear wheels. It's the same engine seen in the X6, but with attention lavished on it by the experts at M Power's experts in their HQ in Garching near Munich. Click 'Next' to read more about the new BMW M5How do you know this is the new BMW M5? Our sources confirm this is the M-powered Five. Which makes sense – it's clearly out on test alongside the current E60 M5 at the (cliched, but tried-and-tested) Nurburgring and the prototype sports quad exhausts, which are an M-car giveaway. Plus the size of the rims, those huge brake discs and the low ride height all point to this being the new M5. While the regular 5-series models will gain plenty of Efficient Dynamics goodies to trim consumption and emissions, it's unclear at this stage if the BMW M5 will gain such green know-how. And what about the M5's gearbox?